Recently renovated three bedroom, three bath home just a 10 minute walk from downtown. Bruce was extremely helpful with suggestions about bikes and restaurants. He also work with the home owner to answer any questions I had prior to our arrival. Thanks Bruce!! My family enjoyed staying at Knot at Work. We were close to town and walked to the shops, store and restaurants daily. We also had bikes delivered and used them to explore the island during our stay. We had flown into Nantucket and did not have a car. We never felt the need to have one with all the various options for getting around the island. Nantucket is a lovely island and we are looking forward to returning next year. Our questions were always answered promptly and the members I spoke with were very courteous and friendly! This was our first visit to the island and it was a great 4 day get-away! Food was delicious and scenery was beautiful. Even though Hurricane Jose wanted to linger a little longer, we managed to see a little sun and the rain only happened late at night! We had a wonderful time and the house was great! Saturday Arrivals and Departures ONLY in season. 7 Night minimum stay during peak season. 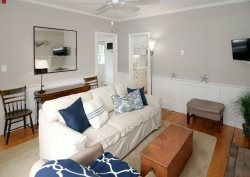 Due to the unique location of Nantucket Island, most visitors make precise travel plans and confirm their lodging in advance. If the accommodation is re-rented for the rental period at the same rate, all payments will be refunded, less a 15% cancellation fee. In the event the accommodation cannot be re-rented for the rental period, the guest is responsible for the full rental amount, or the difference if the accommodation is rented at a lesser rate. Ask a Nantucket Accommodation's reservations agent about travel insurance which will cover cancellations in certain conditions. Our $60.00 service fee is non-refundable.